Not getting much net time at the mo as have been in cyprus the last couple of weeks and am still there, currently in an internet cafe. It doesnt matter if the alignment within camera is right as you can center mir de colli on the focuser tube vignette if necessary, hence centering in the actual focuser tube, the zoom was simply using the zoom feature in sharpcap. Hello. Thank you for this tutorial and all your other videos Dion. I am wondering if I might be able to ask you (or anyone really) for some help. with you who knows this stuff (only had a ED80 before so I know nothing about collimation). This is the result I get when trying to align the secondary. I have tried with a laser colimator before I found your tutorial Dion so I don´t know if I messed it up. That something I will not rule out. Anywhoozle my theory right now is that the secondary is to low, by quite abit aswell. I did "meassure" the spider and as far as I can tell it is central (used astrobabys method). but after reading some replies here it shouldn´t matter if the webcam isn´t 100% aligned? What would your initial thought be of this headache of mine? Secondary looks a mile out, but line mir de collimation up with the vignette that your focuser is creating. Thank you for the quick reply Dion. Might this have been something that I did or? I haven´t touched the spider vanes but I have done some (excessive?) tinkering with the secondary adjustment bolts. Actually solved my problem now. And yes it was my fault (I think). The screw the held the secondary in place was bent. Ooops, I actually replace mine with stainless countersunk hex screws from habit. Thanks Dion for your tutorial. 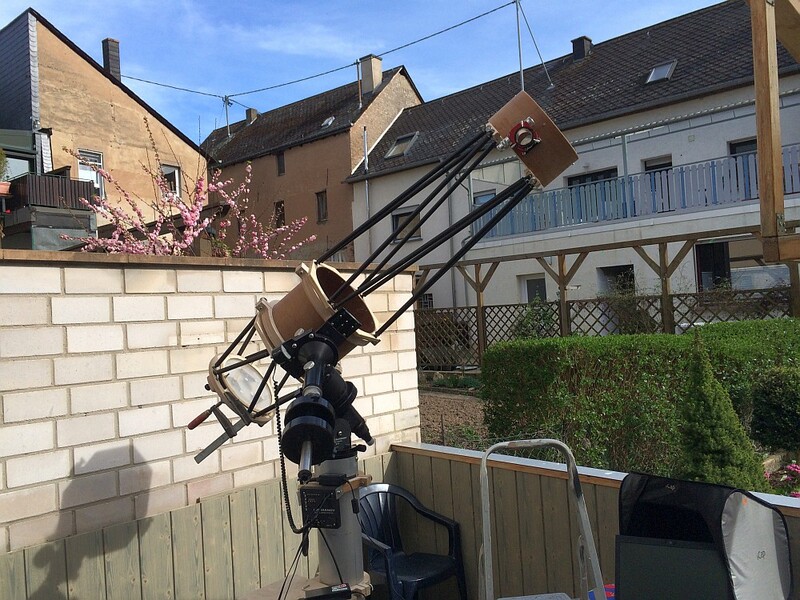 I'm a solar imager, and I collimate during the day after having travelled to a place with good seeing. So, I have no reasonable way to make a star test. Your video raises ***such*** a hope for very fine collimation. As mentioned also by others, my webcam is not collimated/centered. 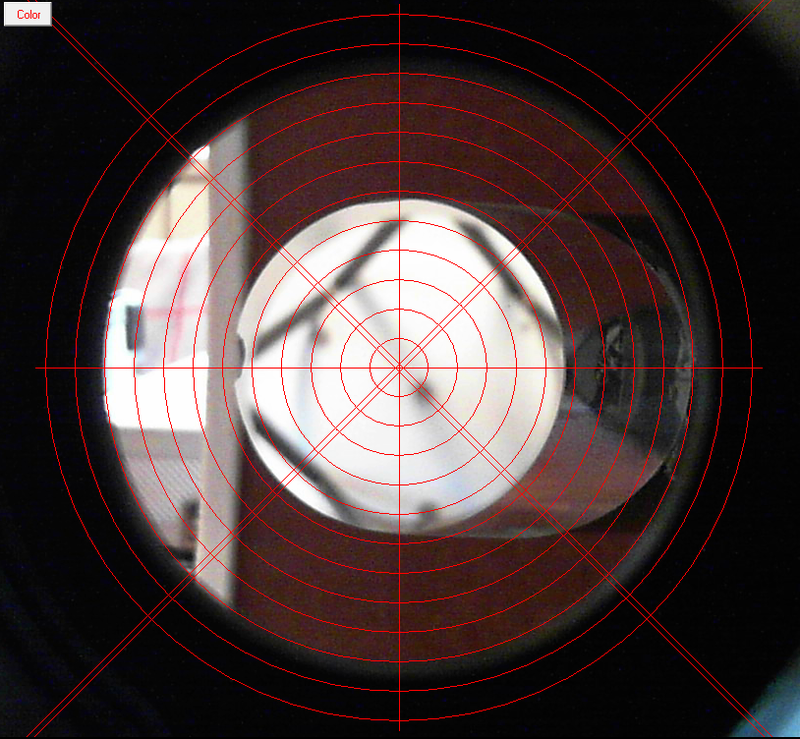 After having perfectly centered the webcam from a mechanical point of view, the vigneting of the focuser end is not centered. With my f7 scope, my guess is that the sensor of the webcam must not be at the millimeter exactly centered. 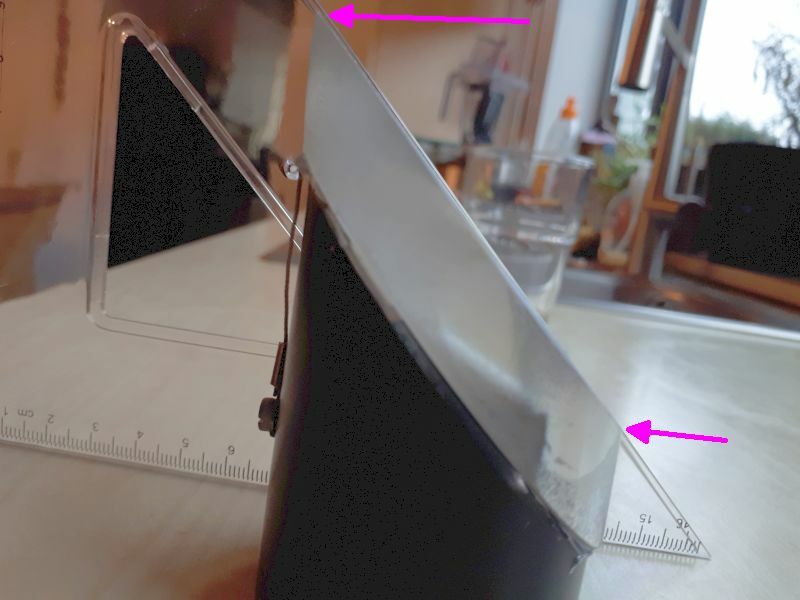 The standard focuser is 31mm and the webcam external diameter is 29mm. The mounting of the lifecam now is made with 2 set of 3 adjustment screws, so to collimate it. I’m not fully centered and the maximum error is (31-29)=2mm. Pic webcam centered with home made sets (green and pink) of collimation screws. It shows a fe degrees of out of collimation. Terrible. Now, the vigneting of the focuser end can be centered. After adjustment, rotating the webcam does not introduce any offset regarding to the reticule. From your video (18:00 and later) and after reading the post belonging to it, I understand that the tilt remains the most important adjustment to do. In my case, I had this results, appealing for more adjustment than tilt. From the video, I understand that I should rotate also. But, how to be sure that the primary cage and the secondary cage are reasonably centered? Pic Hand made exaggerated view of a out of center truss system. 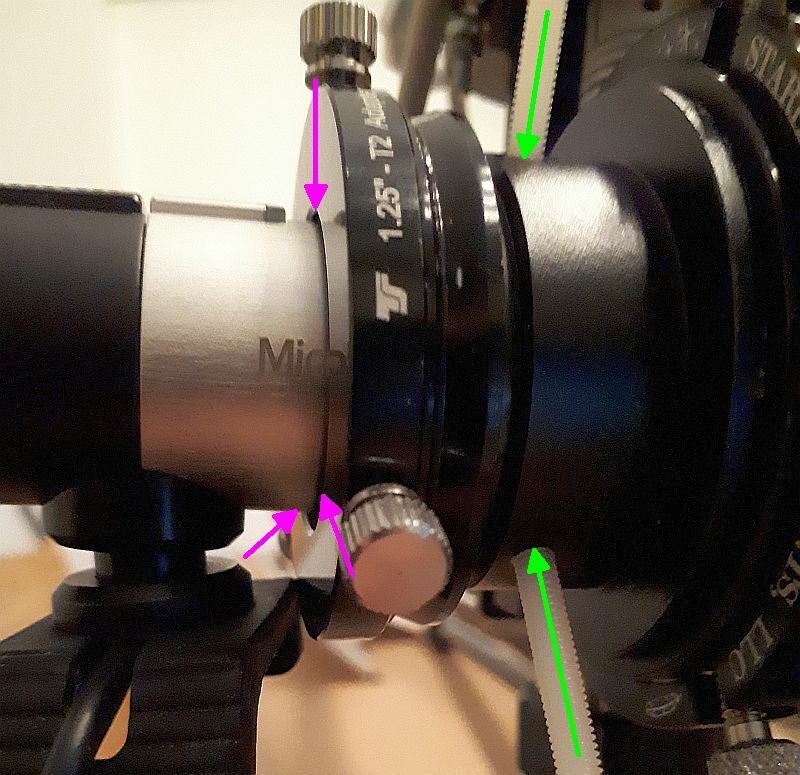 After the tilt correction, do you recommend to slew or to rotate? Or slew is the action we should avoid in any case. With the alignment done (I did a tilt and a slew to aim the primary), when rotating the webcam assembly, the primary start offseting. In one of the post, it is written: "To use you webcam method how do you fit a 1.25"" tube to the cam and know it's perfectly central?" The answer: "if you have the reticule centered etc and you rotate the camera, if it stays on center with the primarp mirror spot then it's in"
And in the other axis, to point over the center of the spider. They are reasonably adjusted, because how to 100% adjust them? In my case, I mounted the secondary myself, with my 2 left hands. It is not exactly at 45°. Also, the mirror axis is probably not 100% on the axis of the secondary support. Both introducing and other sources of error. The video refers to the spider, and the secondary mirror support, which lies against it as the starting position. 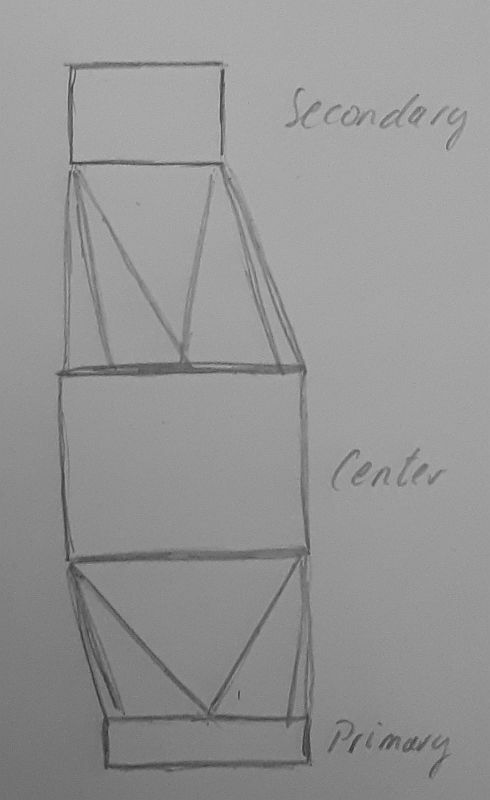 But is this spider center part/secondary support well flat/parallel to the cage top? I'm fighting with getting gooood collimation during the day. Do you see short coming in my description? How to stepwise eliminate/minimize error sources. I'm not good in optics... Any help is appreciated.